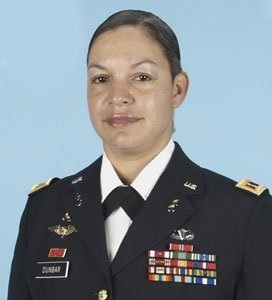 CWO3 Tania N. Dunbar, 40, of Santa Barbara, California died July 19, 2015, while camping at Freeman Park in Carolina Beach, North Carolina. 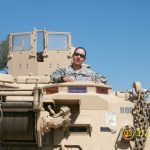 Dunbar was an Electronic Missile Systems Maintenance Warrant Officer with 108th Air Defense Artillery Brigade at Fort Bragg. Tania went to the grocery store in 1998 for some soup. She ended up joining the Army at the recruiting office next to the store. She was so excited that she forgot all about the soup. 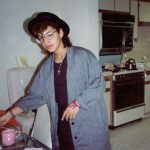 She was still in the Army – and still loving being in the Army – 17 years later when she died. Tania’s mother is from Millinocket, Maine and this stone is from the family’s garden, close to the peonies. It is small and doesn’t weigh a lot, just like Tania. 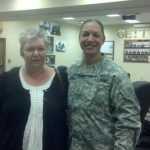 I carried the stone and the story of Army CWO3 Tania N. Dunbar during the 5th adversary of the TSP at BSP. Tania’s stone was brand new to the program so this was a real honor. There was a last-minute change and when I heard this stone did not have a hiker, I happily volunteered to carry it. The only problem would be, I didn’t have a lot of time to do my homework like I normally would do. Hikers research the fallen and really take the time to learn what they can before the launch. Learn, Launch and Letter! Even though I was willing to volunteer in carrying Tania’s stone, I needed to quickly carve out time before the next day to really get to know her. Lucky for me and when I say “lucky”, I truly mean it. I met Tania’s mother the day before the hike, Michelle and her husband. If you are reading this, you should know how much of honor and privilege it was to spend time with you both learning “first hand” what type of woman, mother and solder that Tania was. It was a pleasure having dinner with you both and with my sister. That time we shared and the conversations we had will be something I will never forget. Michelle, I could listen to you tell stories all day long. I could only imagine that Tania had a lot of your infectious personality. It seemed to me that Tania and I had a lot in common. Well when it came to competitiveness and healthy eating. But not brains, she had me beat there and by a lot. It was incredible to learn how much she wanted to learn and it wasn’t just for her own personal gain. She took on added projects and responsibilities to better serve her country and keep her fellow solders safe. And boy did she serve her county. 17 years is an extreme sacrifice for her and her family. I know that she has left behind dear friends and family to whom she had such a big impact on. But from the sounds of it, the net was cast much further than that. There are people all over of this country, who know her by name and the courage it took for her to pave a safer and also supportive way for them. I thought of Tania often as I climbed the mountain that morning. I thought of how she would still try and teach her children to read even when she was deployed overseas. I thought about how she looked out for others. I also thought of you Michelle and your positive spirt. I didn’t grow tired on that hike, I felt at peace knowing that I was walking with my hero. Tania’s stone was assigned to me without plan and now we have a true bond. I’ll never look at candy bar the same again after hearing that story Michelle. I also hope I get to try a batch of your famous cookies someday. Thank you for allowing me to honor your daughter. She will not be forgotten. It was truly an honor and a privilege to carry the stone and the story of CW03 Tania N. Dunbar to the summit of Cadillac Mountain on September 29, 2018. This was the first time I participated in the Summit Project and I was proud to tell the story of Tania and her courage. Tania was a leader who not only successfully led her soldiers with passion and courage, but her community. She bravely sought justice and equality for all soldiers, no matter their gender, race, religion, or sexual orientation. She co-founded SPARTA, an organization that fought for LGBT rights for service members. At a time when the “don’t ask, don’t tell” policy was in place, she pushed for rights of active-duty soldiers to live their lives in the open, without shame or consequence. I am proud of Tania N. Dunbar, for all she accomplished and sad for her family’s loss. She set the example for what it means to be a good soldier, mother, wife, and friend. I wish I could have met her, but carrying her stone, I was certain she was with my daughter and me. She is now a part of our stories as well, as we reflect on the courage she showed in combat and in life as well as the desire to be strong in our convictions when fighting for what is right and true.